If you run out of GPIOs on your board, the easy way is to add an I2C GPIO expander, but those are normally limited to 8 or 16-channels, so Land Boards decided to create a board with 8 IO expanders making it a 128 channel IO expander that works on Raspberry Pi, BeagleBone Black, Arduino, and basically any boards with an I2C hardware or software implementation. Data Storage – Microchip 24LC024 2K EEPROM with board info. You can find out to use the board in the Wiki for code for Raspberry Pi, and Arduino, Since it’s using address range 0x20-0x27 of the I2C, you could most probably use it for other boards such as ESP8266 module or STM8s boards for some extra efforts provided there’s enough storage and memory. 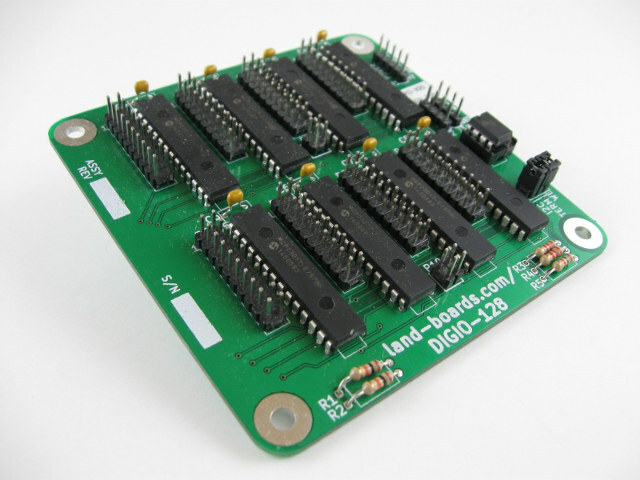 DIGIO-128 board can be purchased for $75 on Tindie, or directly from Land Boards product page. There’s also a version with 64-channels called DIGIO-64 going for $50. It seems a bit expensive, considering there’s cheap CPLD boards on eBay (half of the total pins though) for less than 5£.